I had a great time attending the KidzVuz Back2School Bash in New York City. My only regret was not having my mini me in tow with me. I think I was excited about the scavenger hunt more than anything else. I liked being able to visit the booths and learn about the brands while accomplishing the mission, because you know I take scavenger hunts seriously. Lol! I would have to say that my favorite booths off the top of my head were Lysol first and foremost! I’m a germaphobe and use Lysol All Purpose Cleaner, Lysol Disinfectant Spray and Lysol Disinfecting Wipes regularly. I can’t wait to try the new Lysol Tap Top and the new Lysol Click Gel for the toilet. My youngest is a germ magnet and has asthma, year round allergies and eczema. I’m always making sure everything is wiped down and clean. An average cold for him turns into a ER visit, followed by Pediatrician follow up visit. It’s in our best interest to keep the germs away and stay healthy! I was a germaphobe before kids, they just made me worse. I do love that I’m raising them to live a healthy lifestyle and pay attention to their surroundings especially at school and in public places. I love that their teachers request the Lysol Disinfecting Wipes on the Back to School Supply List. Dentek was another favorite of mine. The fun flossers, floss picks + case and toothbrush covers were all so fun and colorful. Dental Hygiene necessities, great for home, travel and on the go! The next booth I had a great time at was Chuze! Chuze is a great app that allows you to grocery shop smarter. I was able to get a live demo and was blown away! You can create your shopping list within that app, check on deals and coupons allowing you to save money and share your list with family members. The feature that I absolutely LOVE… your list is mapped by the aisle in your store with easy check-out. I love to go to the same grocery store chains but, often will visit different locations and the layout will be different from the one I normally visit. This app allows me to go directly to the aisle where the item is without me getting all turned around inside the store! There have been times when I have walked each and every aisle in a grocery store looking for an item. This is a time saver! I don’t have to know the store layout, the app will tell me where I need to go based upon my listed items. Winning! Okay, I’ll stop bragging about this feature now but boy am I happy! Try it out. The Chuze app is available in the iPhone App Store and on Google Play. No Kid Hungry is on my list of course. I am always going to stand behind a good cause. I also liked that LG had the Jr Chefs preparing food and they partnered with No Kid Hungry by donating $10 for every tweet helping a child struggling with hunger for up to 100 meals. 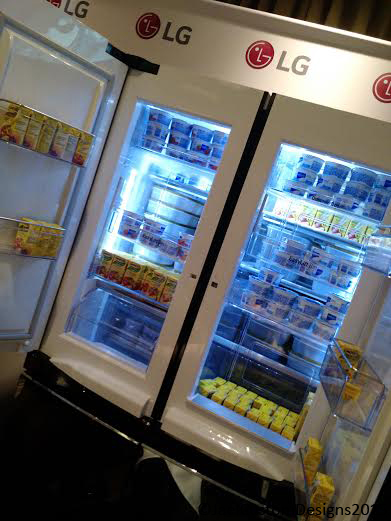 Oh, the LG appliances being showcased at KidzVuz Back2School Bash had me drooling! 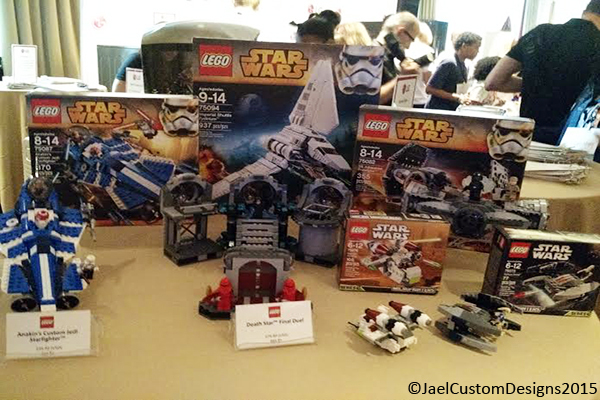 Lego and Lego Dimensions was in the house! I loved the Star Wars Lego sets. I was looking at them for myself. Mini Me will just have to share with me. I’m also excited about the launch of Lego Dimensions. I was able to see a live demo and it looks like tons of fun. We are a gaming family so it’s a daily part of our life. I’ll be waiting patiently until the September launch. I had fun at the Hasbro booth and even bumped into a few of my blogging buddies while taking pictures with the branded Hasbro backdrop. I got a chance to meet Natalya Neidhart & Mark Henry from WWE. We got a chance to snap a few pictures and I even got a signed poster from both of them for my son. That was a great experience. I am happy that I got a chance to visit the .Me booth. I still need to go register for my .Me domain. I’m just having a hard time trying to figure out what I want. My name isn’t available. Decisions… Decisions! I will be happy to tell you that I successfully completed the scavenger hunt! I did miss the GameStop booth, however I plan to connect with them in the near future. I am a loyal consumer and already have Disney Infinity 3.0 on pre-order through them. There were so many great brands present. Thank you to KidzVuz for a great event and my son LOVED all the swag. 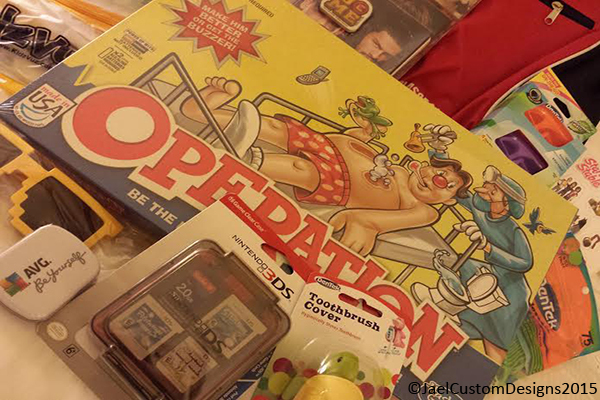 We can’t stop playing Operation! So, that was my KidzVuz Back2School Bash experience in a nutshell and I loved it! So glad you had a great time! If people are interested, they can find deal on Lysol for back to school at Amazon here: http://amzn.to/1KDYQ6V. And they can find the Chuze app at the app store here; https://itunes.apple.com/us/app/chuze/id977475333?mt=8!